Celebrating the life of Roy Dale, Sr.
Obituary for Roy Dale, Sr.
Roy Dale, Sr. of Cordele passed away Monday, January 21, 2019 at Crisp Regional Hospital. Funeral services will be held at 2:00 p.m. Friday, January 25, 2019 at Memorial Park Funeral Home, 2030 Memorial Park Drive, Gainesville, GA 30504. Burial will follow in the Memorial Park Cemetery. The family will receive friends Wednesday, January 23, 2019 from 6:00 - 8:00 p.m. at Rainey Family Funeral Services in Cordele. Roy, 91, was born in Maysville, GA and was the son of the late John Dale and Etheleen Potter Dale. He was also preceded in death by a daughter, Fern Loraine Dale. He served his country honorably with six years in the Army and 24 years in the Navy, where he retired as a Master Chief Petty Officer. 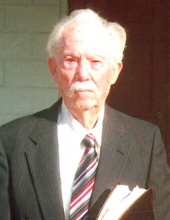 He was an active and beloved member of Pleasant Grove Baptist Church and had taught Sunday School as long as his health permitted. He always had a smile on his face and brought joy to everyone that he met with his great sense of humor. Roy is survived by his wife of 71 years, Carol Jane Dale of Cordele; a son and his wife, Roy, Jr. and Becky Dale of Cordele; a sister, Shirley Simmons of Nicholson; and grandchildren, Heather Dale Adams, Amy Cranford, Johnny West, Stephanie Windon and Jennifer Dale. To plant a tree in memory of Roy Dale, Sr., please visit our Tribute Store. "Email Address" would like to share the life celebration of Roy Dale, Sr.. Click on the "link" to go to share a favorite memory or leave a condolence message for the family.